Manager - Graduate from the recognized University/ Institute with diploma in law/ PGDBM from a recognized Institution. Senior Engineer - Degree/ Diploma in Mechanical/ Production Engineering or Diploma in Tool & Die Making from a diagnosed University/ Institute. Engineer - Degree/ Diploma in Mechanical/ Production/ Electrical/ Electronics Engineering or Diploma in Tool & Die Making from a recognized University/ Institute. Personal Assistant - Degree from a diagnosed University. Knowledge English Shorthand/ Typing at a velocity of a hundred/40 W.P.M and knowledge of Computer Applications. Age Limit - Maximum age restriction is 40-years for Manager, 35-years for Senior Engineer & 30 years for Engineer/Personal Assistant. Age Relaxation - 05 years for SC/ST/Internal Candidates & 03-years for OBC Canddidates. Fee - Candidates must Pay Rs. 100/- thru Demand Draft In favour of ”Indo Danish Tool Room”, payable at Jamshedpur. 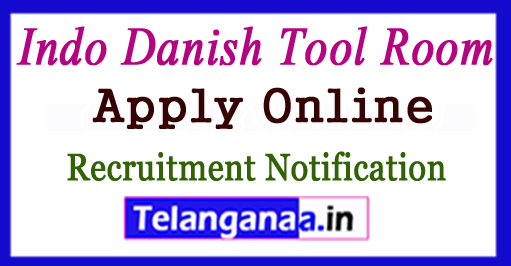 Interested applicants may practice in prescribed software shape along side self attested image copies of certificate and financial institution draft send to Indo Danish Tool Room, (Ministry of MSME, Govt. Of India) M-four (Part), Phase-VI, Tata-Kandra Main Road, P. O. Gamharia, Jamshedpur-832108 on or earlier than 30 Days From Date Of Publication. Last Date of Application form - 30 Days shape the Date of Publication.